Homemade Rice flour Laksa noodles for Asam Laksa/ Asian fish soup. 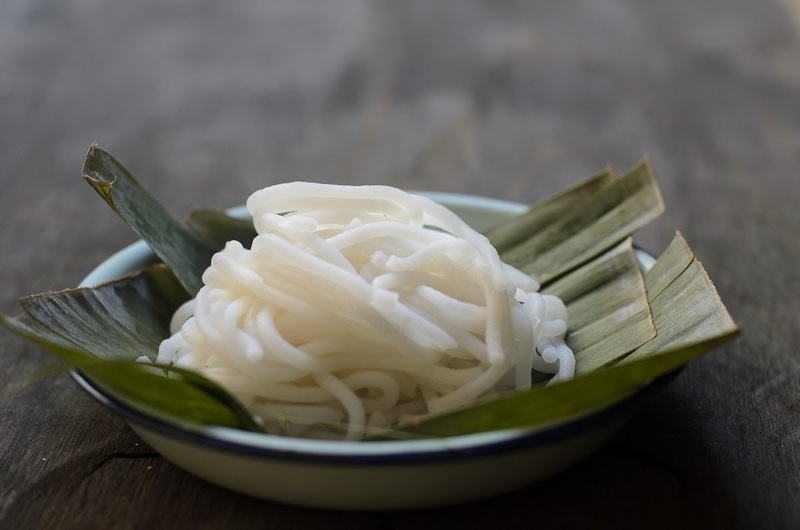 This rice noodles are serves with sour, tangy spicy fish soup known as Laksa. Common dish and favourite among Malaysians. Packets of dried rice noodles (not to be mistaken with dried rice sticks) are sold in Asian grocers but I chose not to buy them. First, I have to soak the noodles overnight. Third, after all the hard work of soaking and boiling, I ended up with broken rice noodles as well as mushy ones. Due to the reasons stated above, a packet of spaghetti was often used as a substitute for the rice noodles. In other words.... I am lazy to fuss about making and boiling the store-bought rice noodles! Its more to do with that nostalgic feeling as well as that "YES!!! I can make it too" satisfying feeling. I grew up in small quiet kampung/ village in the north of Malaysia, Kuala Kedah. The place was famous (and still is I presume) for its Asam Laksa / Asian fish soup. There was one house, not far from my parent's, they were selling good Asam Laksa / Asian fish soup, in their front yard. Their laksa was well known in the neighbourhood, served with coconut sambal. I loved their laksa and they used homemade rice noodles. Call me fussy, but I definitely do not like the texture of the commercial ready made laksa noodles, readily available, sold in either market or supermarket in Malaysia. 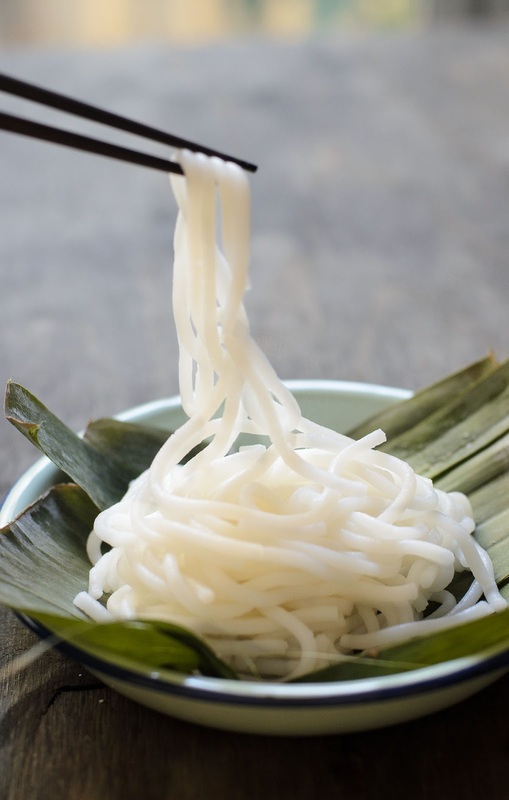 The ready made store bought rice noodles are a bit chewy and springy. Feels like the store bought ready made rice noodles does not absorb the fishy soup as much and left me chewing the noodles at the end. 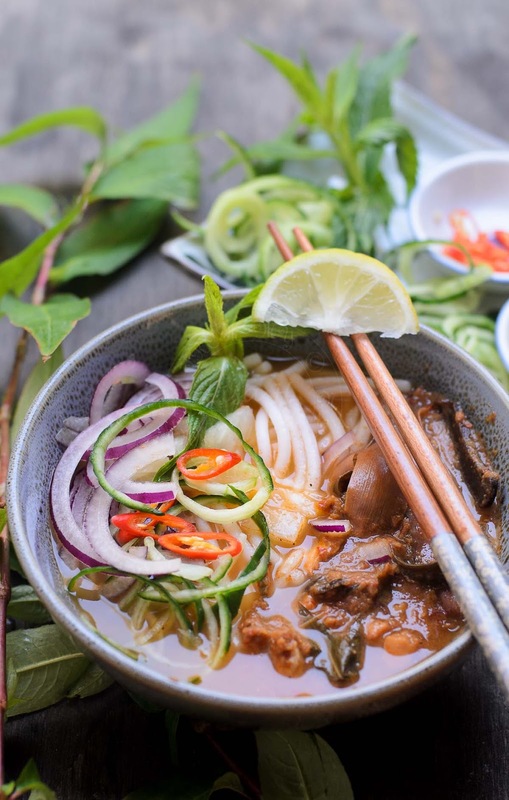 Watch my video below, on how to make the rice noodles or visit my YouTube Channel for other delicious dishes. Homemade Laksa noodles for Asam Laksa. Laksa noodles made from combination of rice flour and tapioca flour. Gluten free noodles. Mix the 2 flours in a mixing bowl. Cover with cling wrap and leave it to rest for 30 minutes. Press the dough into hot boiling water. Leave the rice laksa noodles for 2 minutes, until noodles floats up. Scoop and transfer the rice laksa noodles into the ice bath. 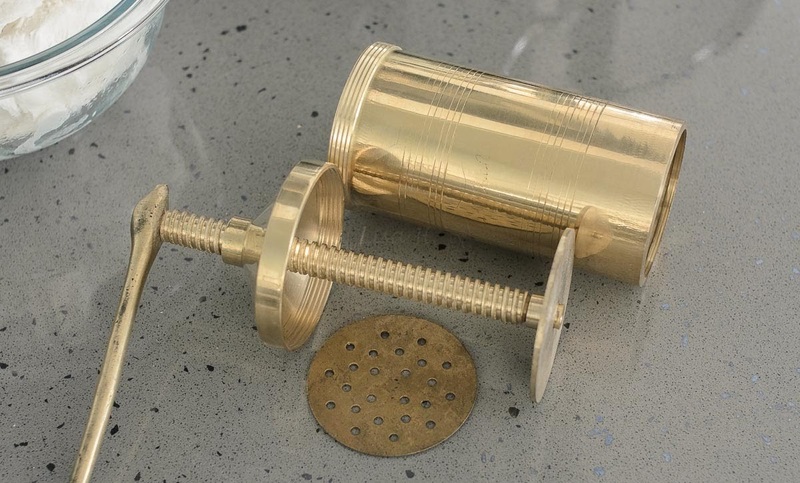 1) If you do not have the maruku maker mould above, I suggest using this cookie/ biscuit press. 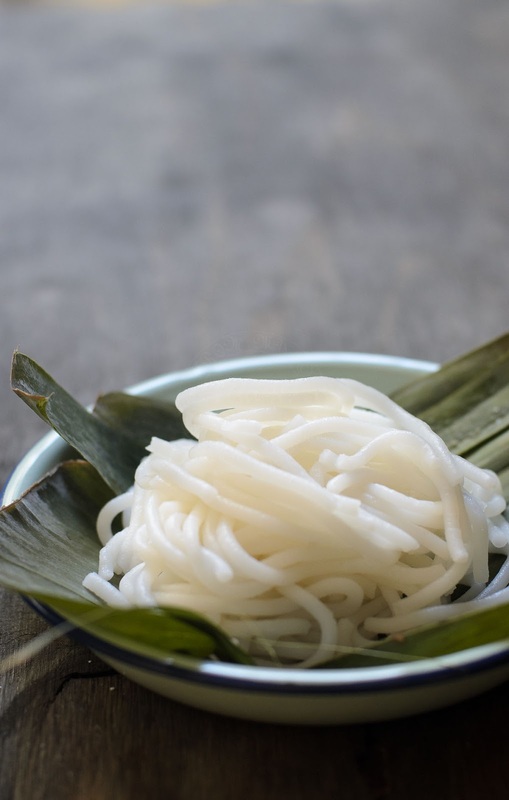 2)Best to consume on the day, you make the rice noodles. 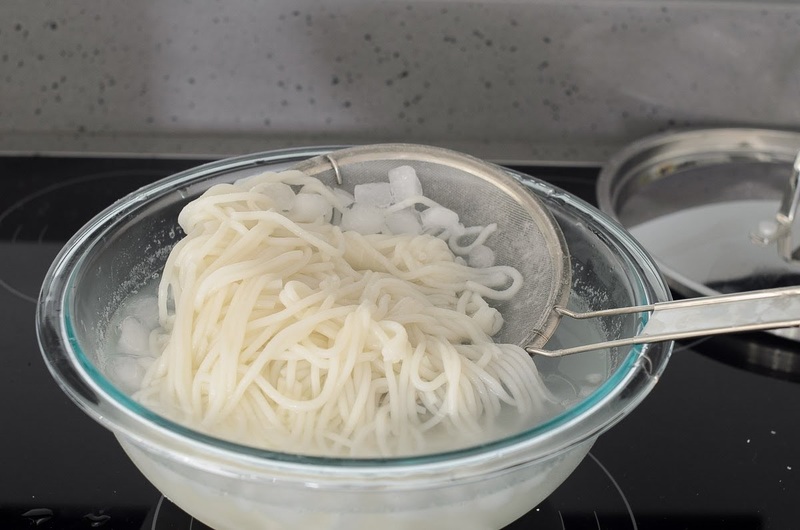 Noodles will break up into shorter strands when you refrigerate and re-heat.